Seemingly don’t function before 12pm, spend half the day (or what’s left of it according to early risers) wandering around trying to find free WiFi and the other half locating decent places to poop! 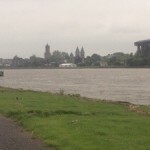 After disbelieving our source of campervan stops, or ‘Stellplatz’ as they are signposted here, we followed the river into Koln and then the road signs to the zoo, which so far had proved to be the location of many such sites along the route so far (we have already graced to of such). Our instinct proved correct as we drove past the zoo and the Stellplatz sign on the motorway ring road, leaving us another 40 minutes to gather our bearings, decipher the spaghetti ring road and get back to the camper stop. There then followed a 6km round trip walk for chips at midnight that brought us back along the bank of the heavily swollen Rhein to no free internet. The next day’s plan of action was to take in some of the sights of the city whilst finding internet and a pooping place, hopefully at the same establishment so as not to look suspicious. It is not that we are adverse to using the facilities in the campervan, quite the opposite. We have indeed fully christened all of her amenities in full. What we haven’t yet done is find a motor home/caravan shop that sells the end cap for the cassette toilet. This means that at the moment it is sealed with a piece of plastic and a rubber band, which has proven to be inadequate when dealing with solids, roundabouts and speed bumps. So the afternoon was spent drinking lattes in Starbucks and downloading co-ordinates of camperstops for the next couple of days, including a mix of those with service points, water and waste disposal, usually free, and those without. All whilst catching up on email and Facebook before the battery and the laptop run out. 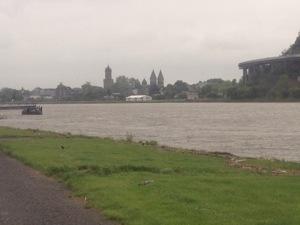 The next couple of nights would be spent on the bank of the Rhein in a little village north of Koblenze. We filled and emptied our tanks and headed out of Koln. Two contented nights were spent watching pleasure boats and container ships going up and down the river. Happy with the tranquillity, we spent the day between making use of our on board twin tub easing machine. It worked like a dream, if not sometimes a nightmare given the fact that if you made it do two things at once, or had something else plugged in charging batteries, it protested and blew the fuses to the inverter. It demanded your 100% attention to its hypnotic was and spin cycles. In hindsight, attention that was diverted from the amount of water it was consuming and our rapidly depleting supply. We left the banks of the river and headed to the peculiarly named ‘Worms’, the oldest township in Germany apparently, to wander around with cameras and refilling our supplies. The riverbanks and valleys were strewn with castles and fortressed houses on the way upstream and we were looking forward to a photographic paradise at our destination. Instead we were greeted by a travelling fair, filled car parks and no service point. Added to this, no free WiFi to find our nearest service point and seemingly our source of info had never been south of Frankfurt. We decided to change tack and head south for a campsite or Stellplatz, neither of which were forthcoming. In the hills north of Heidelberg we ran out of gas too. Our second 7kg bottle of butane had given up the ghost too. This drab, miserable month of May, apparently the worst for nearly thirty years was eating through both our resources and our resolve like a form of flesh eating staphylococcus. On happening on a campsite we were turned away on the basis that the ground was too waterlogged as apparently it was November, however we were sold a camping gas cylinder for €120 (after all, they are imported from France) so at least a hot drink and warm bed was back on the cards. In dismay we headed west for Karlsruhe, for a garage for bottled water to make a soothing coffee and a car park to overnight in. We found a camperstop next to the river and contemplated plans of disposing of at least one of our empty gas bottles and how to overcome our blight of Stellplatz spots. With damp and disheartened spirits we hit the sack, but at least we had pooped.